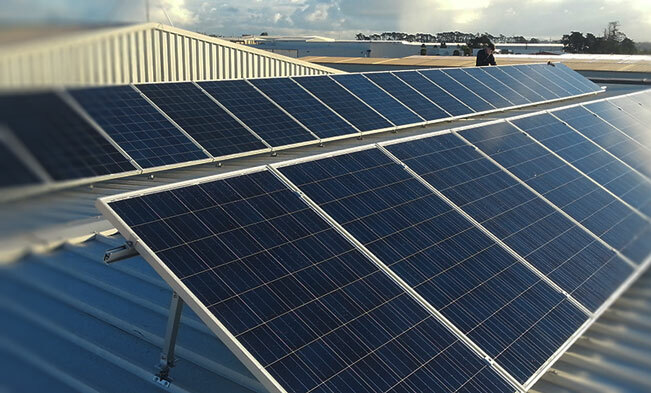 There are a broad range of mounting systems available to suit every roof type and application, so Metalcraft Solar will specify and provide the most appropriate solution for each situation. Penetration fixing solutions are most common for long run roofing, however there are also clamp solutions available for standing seam roof profiles. Metalcraft has developed a customised mounting clamp to suite its espan standing seam roof profiles; and development is in progress for clamp solutions to suit out Metdek 400, 500 & 855. Because these profiles are concealed clip roof systems, and often used on flat pitched roofs, these clamps eliminate the need for penetrations to mount solar modules. Although they do add some cost above the basic ‘L-bracket’ method, they are highly recommended as it means the risk of water ingress from penetration fixings is eliminated. These have been extensively tested and are supported by a PS1, and can be purchased on a supply only basis. Tilt mounting solutions may also be appropriate in situations where the roof space is of a flat pitch. Using this bracketry to elevating each panel to the optimum tilt will ensure you are realising the full potential energy generation possible. This does add some hardware cost, but we can advise on whether the extra generation you stand to achieve justifies the additional installation costs based on software modelling. Another option to consider might be a ‘Ground Mount’ solution. This is an alternative method that enables a Solar array to be mounted on a Steel or Timber frame that is set into the ground. This would be appropriate for those wanting a larger system than the available roof space can allow, or those with plenty of space that would prefer not to have modules on the roof. However the catch is that there is some additional cost in the hardware, and a trench is required to deliver the generated energy from the source into the home. This is a common solution for those establishing themselves ‘off-grid’ greenfield situation where a larger array is required then most ‘grid-connected’ applications.